The colours were B02, BV02 and YG03. Now these are very pretty colours that work beautifully together. However, I don't have any papers that match at all! So... imagine my surprise when I realised that I was the one who actually chose this colour combo!!! What an idiot?! Really like this image. I received just this one in a swap a little while ago and I so need to by the whole lot as I love them! Oh well, maybe payday...! Paper: MME Quite Contrary from Dies to Die For. Copic Markers: E00, E11, E43, E47, E49, E50, E51, E53, B00, B02, B05, R81, R83, R85, YG03, YG63, YG67, BV00, BV02, BV04, W1, W3, W5, W7. Tools & Embellishments: Ribbon, flower and pearl from stash. Make sure you stop by the CCC blog, we have a few questions we'd like to ask you! Stacey this is FABULOUS, LOVE this image!!!! such a fun card stacey...that image is great! Fab, fun & fresh card - love it! Oh she is fabulous, brilliant card Stacey. I'm a 30-something blogger who lives in Southampton my lovely husband Alistair I have been crafting since the start of 2008. 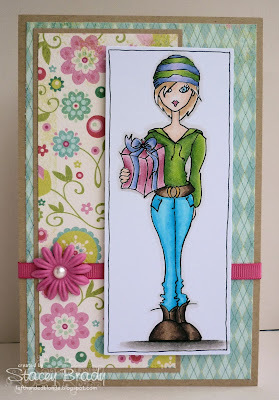 I love making cards, but also enjoy whipping up a storm with my sewing machine or a pair of knitting needles! I've had a little bit of a crafting break over the past couple of years, mainly due to my ridiculously demanding day-job. However, I miss crafting so much that I'm determined to make more time for my hobby! Challenge #477 - Amazing Women! It's a Double Card Whammy! Whimsy Digi Image Release Party Hop! Anyone for Anya? - Get in Shape! Sunday's with Crissy - Guest Designer! Anyone for Anya? .... anything goes!